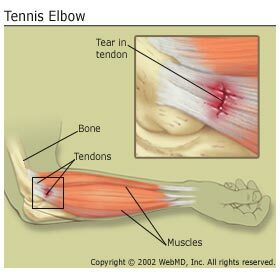 Tennis elbow (also known as lateral epicondylitis) is inflammation of the tendon that attaches to the outside of the elbow. This tendon attaches to muscles that are responsible for bending the wrist backward. If you have tenderness on the outside of your elbow, sore forearm muscles, stiffness of your elbow when you wake up, or pain in your elbow when holding something, you may have tennis elbow. Watch this video about tennis and golfer’s elbow! Chiropractic adjustments restore motion to the elbow joint and increase the range of motion. Ice and interferential current may be used to reduce the amount of inflammation in the area. ART is used to break up scar tissue and improve joint function. Further, stretching and strengthening exercise are incorporated into the treatment plan at the appropriate time to reduce the possibility of re-injury. Acupuncture, in conjunction with other treatments, speeds up the healing process, and decreases inflammation. Acupuncture does this by stimulating the natural release of endorphins, which are the body’s natural pain killers. Dr. Rodwin and our naturopathic doctor are certified acupuncturists and will recommend this method of treatment if it is warranted. Massage therapy decreases inflammation, reduces irritating adhesions, increases circulation to compromised tissue, and maintains range of motion of the affected joint. Restoration of muscle strength and length are additional goals of massage therapy. Massage therapy also helps to prevent recurrence by addressing perpetuating factors or causes. Not quite your elbow problem? Read about Golfer’s elbow (medial epicondylitis) here! For other conditions that we treat, click here!